Driving with a chipped windscreen | Is it legal? We are all familiar with the many adverts for windscreen replacement companies which stress the importance of having windscreen chips fixed early to prevent them getting worse. We all know the potential for a chip turning into a crack however, in our increasingly busy lives, having a chip on your windscreen repaired can often fall way down the list of priorities to deal with. But is it legal to drive with a chip on the windscreen, even if we know its not the best thing to do? Driving around with a windscreen chip or crack could constitute use of a motor vehicle in a dangerous condition and this is an offence under section 40 of the Road Traffic Act. if you were to be caught driving the vehicle in such a condition you could receive a fixed penalty of 3 points on your licence and a fine. If the matter were instead to proceed to court you could be at risk of a much higher fine or indeed a disqualification particularly if you have previous convictions or were driving on a commercial basis. The Highway Code, whilst not strictly legislation, also deals with the matter. Rule 97 states your vehicle must be “legal and roadworthy” and Rule 89 states it should also comply with the Road Vehicle (Construction and Use ) Regulations. This legislation essentially states that the driver should have a full view of the road and traffic ahead and all glass fitted to a motor vehicle should be maintained in such a condition that it does not obscure the vision of the driver whilst the vehicle is being driven. Furthermore, should you have an accident as a result of not being able to see adequately through the chip/crack, you could end up being charged with driving without due care and attention and as could struggle to defend the matter if the damaged windscreen was known to the police. In addition to the above, driving around with a chip in your windscreen could cause problems when you need to MOT your vehicle. There are clear rules about what must be repaired on different parts of your windscreen, particularly the part that is swept by your windscreen wipers. Depending on the size and position, a chip on your windscreen can be a distraction or even impair vision. If a chip is in the driver’s line of vision, it only has to be bigger than 10mm for your windscreen to fail its MOT. The MOT testers manual refers to ‘any damage not contained within a circle of 10mm’ so a cluster of much minor damage could also fail. Additionally, damage larger than 40mm in other areas on the windscreen will also fail. It should be noted that most chips can be repaired before they eventually crack and this is a much less expensive and easier way of dealing with the problem. Damage of up to 40mm can sometimes be repaired, depending on where on the screen it is situated. 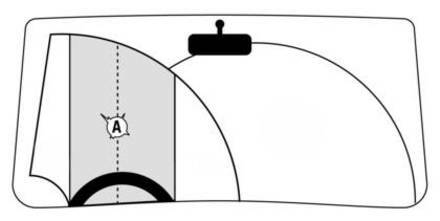 If the damage is right in front of the driver (known as the ‘A zone’) only damage up to 10mm can be repaired. Repair involves cleaning and drying the damaged area before filling it with a clear resin with similar optical properties to glass. “Contact your insurance company in the first instance as most insurance companies have arrangements with windscreen repair companies. They are often able to repair the chip at a nominal fee to yourself and sometimes even at no cost. They often attend at your home address or place of work and the work takes less than an hour. Furthermore, this generally does not affect your no claims bonus although you should check the contents of your insurance policy to be sure.